Get Involved with a Great Cause! 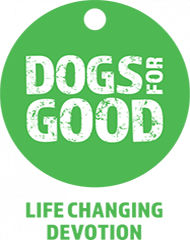 We’re delighted to be working hard across the UK to help raise funds for Dogs For Good, UK. We initiated an official partnership at the beginning of 2018, with fundraising beginning in earnest. The charity, which is has recently been celebrating its 30th anniversary, trains dogs to help children and adults with all sorts of challenges, including autism, physical disabilities, special educational needs and dementia. Can you help? Get in touch with your local Barking Mad and join in! Barking Mad are attending, supporting and organising events across the UK in order to sponsor puppy training and Dogs For Good’s projects.